Bruce Mittelman will give a presentation of the 4K Video Downloader suite of applications - 4K Video Downloader, 4K Stogram, 4K YouTube To MP3, 4K Slideshow maker. Bruce will also show a selection of the latest graphics apps for your iPhone and iPad. Louis Perez will give another installment of his "Magical Mystery Tour of the Web" which focuses on interesting websites related to a specific topic. This month's topic will be "Video Streaming Sites". George Ajjan will demonstrate Print Window, the app that offers the ability to print a file listing directly from within the Mac OS X Finder. George will also give another installment of "Three Things To Know On Your Mac" in which he'll show interesting tips and tricks that anyone can use to improve their Macintosh workflows. And we'll be talking about all the latest Apple and technology news and have our "Question & Answer" session where our experts will try to solve your problems. As always, a meeting you won't want to miss! Hope to see you all there! The New Jersey Macintosh Users Group (NJMUG) is a computer club which focuses on all things Apple. Whether you use a Macintosh computer, Apple iPod, Apple iPad, or Apple iPhone our meetings will allow you an opportunity to learn as well as share your experience with other like-minded individuals. NJMUG currently has approximately 45 members whose knowledge ranges from beginner to expert. Members of the general public who are considering membership in NJMUG may attend two general meetings as NJMUG guests; otherwise, meetings are open to members only. Membership in NJMUG is $30.00 per year and entitles you to attend monthly meetings as well as the numerous other member benefits. NJMUG general monthly meetings occur on the third Tuesday of each month, beginning at 7:00 p.m. and ending at 9:45 p.m. From 7:00 p.m. until 8:00 p.m. we have our "Question and Answer" session, discuss the latest Apple news, and talk about general Macintosh, iPad, iPhone and iPod technology. 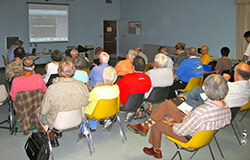 The main presentations begin at 8:00 p.m.
We offer wireless Internet access at our meeting location. Members are able to bring their laptops or other wireless devices and obtain Internet access during our monthly meetings. NJMUG general monthly meetings are held on the third Tuesday of each month. Past meeting agendas along with public distribution files are available on our meeting archive page. Monthly member-only distribution files are available for download in the members section. Founded in 1984, NJMUG is the Garden State's flagship Macintosh Users Group with members throughout New Jersey. Our community of members are dedicated to sharing their knowledge, insights and experience on the Macintosh computer platform. The MacLedger is NJMUG's monthly newletter and focuses on current Apple news, reviews, and how-to's. The MacLedger is published in pdf format and is available to all current NJMUG members. Download our membership application and mail in with your membership dues or bring it with you to any monthly meeting. Copyright © 1996-2019 New Jersey Macintosh Users Group, Inc. All rights reserved. Apple, Macintosh, the Apple logo and all other images and trademarks are the property of their prospective owners and are hereby acknowledged as such. Advertising provided by: Clifton Insider. Hosting courtesy of MacHighway.com.